Mouse anti Human ASGR2 OTI4B6. 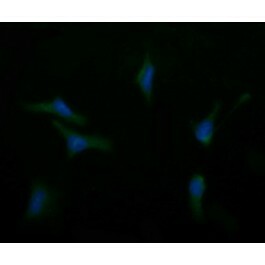 Product is tested for Immunocytochemistry/Immunofluorescence, Western blot / Immunoblot. Full length human recombinant protein of human ASGR2(NP_001172) produced in HEK293T cell. This gene encodes a subunit of the asialoglycoprotein receptor. This receptor is a transmembrane protein that plays a critical role in serum glycoprotein homeostasis by mediating the endocytosis and lysosomal degradation of glycoproteins with exposed termil galactose or N-acetylgalactosamine residues. The asialoglycoprotein receptor may facilitate hepatic infection by multiple viruses including hepatitis B, and is also a target for liver-specific drug delivery. The asialoglycoprotein receptor is a hetero-oligomeric protein composed of major and minor subunits, which are encoded by different genes. The protein encoded by this gene is the less abundant minor subunit. Altertively spliced transcript variants encoding multiple isoforms have been observed for this gene. [provided by RefSeq, Jan 2011]. PBS (PH 7.3) containing 1% BSA, 50% glycerol and 0.02% sodium azide. Human	 12.5% SDS-PAGE Stained with Coomassie Blue. in vitro transl.